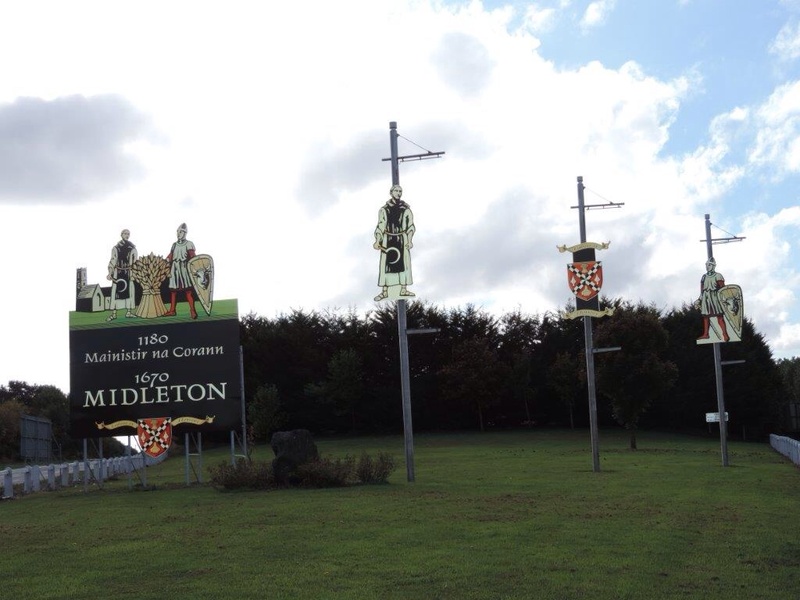 The Mad Monks of Midleton – really! The Mad Monk Bar and Bistro on Church Lane in Midleton. It stands right beside the churchyard of St John the Baptist. This church is actually built on the site of the Abbey of Chore or Mainistir na Corann, founded for the Cistercians in 1180. On Church Lane in Midleton there is a bar/bistro called Mad Monk. This establishment was called O’Riordan’s Pub when I was growing up and then became Joe’s of Church Lane. The name Mad Monk was given to the pub more recently. Curious about the change of name (which occurred when I lived in Limerick) I went in recently to inquire why the place was called Mad Monk. The personnel behind the bar hadn’t a clue – they were very clear about that. It seems that nobody had explained the origins of the name to them. One clue may be in the pub’s logo – a monk indulging in beer! 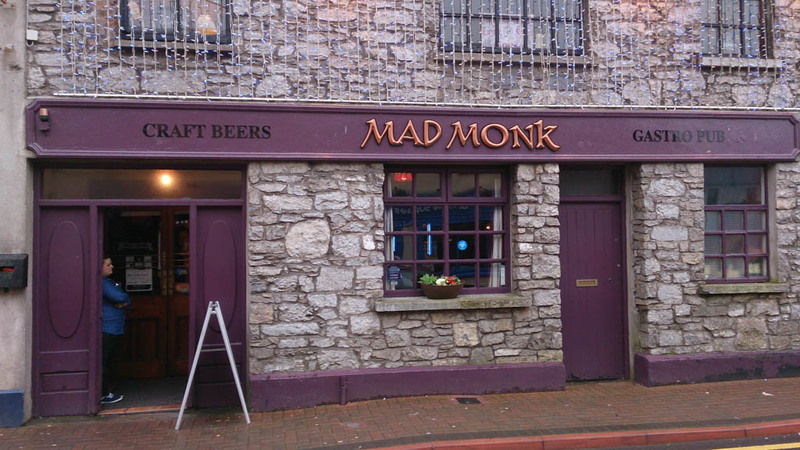 Logo of the Mad Monk Bar in Midleton – not quite the version that comes to mind when discussing the actual mad monks of Chore/Mainistir na Corann in 1228/1229. Clearly this image depicts the Brother Cellarer – note the keys for locking up the beverages! But there were mad monks in Midleton or Mainistir na Corann in the early 1200s. And they were hopping mad! Not gaga mind you, just furious that they were being called to account. How bad were they? Well, a letter written to them in 1228 tells us. They are addressed as the Community of Chore. To the Community of Chore, greetings. The charge of much disorder as well as rebellion and conspiracy…..perpetrated in your house in the past year against the visitor sent to you on behalf of the General Chapter, namely the Abbot of Tintern Minor, has been brought to our attention by reliable and trustworthy men. He removed your former abbot, Brother R., from office for refusing to submit to the authority given to him, and at the same time he placed your church and you yourselves under interdict and suspended you from the divine services for as long as you supported the beforementioned R. as abbot or recognized him as your abbot. This opening to the letters sent by Stephen of Lexington, Abbot of Stanley, was probably not what the monks of Chore or Mainistir na Corann wanted to read. And it was very a serious recital of the charge against the abbey as well as the penalties imposed on the abbey. But what exactly was it all about? Right from the start, the Cistercians in Ireland faced trouble – from the Irish monks themselves. Some years after the establishment of Mellifont Abbey in 1142, the French monks quit the place and returned to Burgundy with complaints that the Irish had some very strange interpretations of the Cistercian Rule. You may recall that the Cistercians were a reformed version of the Benedictine order, but were more rigorous in their interpretation of the Rule of St Benedict. They were also more tightly organized throughout Europe, whereas the Benedictines were organised more loosely. For example, every year the Cistercians had a Europe-wide meeting called a General Chapter. This meeting was held in Burgundy, either at Citeaux or at Clairvaux. Representatives were sent from every national affiliation of Cistercian monasteries – this meant that the monasteries founded from Mellifont represented the Irish affiliation, sending three abbots to the General Chapter. Furthermore, the Cistercians interpreted the Benedictine rule to rigidly structure every moment of the day for the monks – both choir monks (educated men who were usually ordained) and the lay brothers (‘peasant’ monks who tilled the fields and did all the manual labour). Cistercian monks had to sleep in open dormitories – one for the choir monks and one for the lay brothers. There were various other rules – like the lack of ornament in their churches (unnecessary according to St Bernard of Clairvaux). However, this was fine in a country with a tradition of Benedictine monasticism. Ireland was not one of these countries – and so a rigourous interpretation of the rules was more the exception than the norm in Ireland. 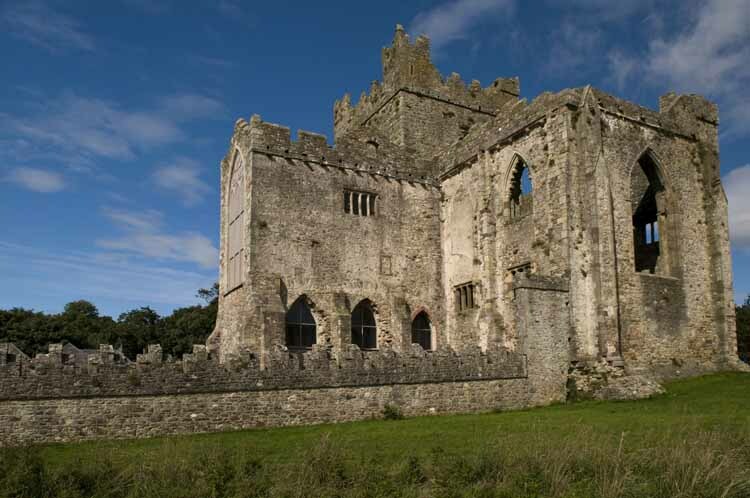 From a very early date, Irish Cistercians slept in cells rather than in open dormitories. They accepted decoration in their churches, they often failed to attend the General Chapter – a VERY serious offence in the eyes of the Cistercian Order. In 1195 the abbot of Chore/Mainistir na Corann was one of the three representatives of the Irish Cistercians at the General Chapter. 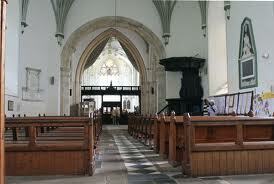 Intriguingly the abbot was ordered to go to Dublin impose a penance on the abbot of the very rich abbey of St Mary’s. The reason? the abbot of St Mary’s was one of the three representatives from Ireland for the previous year’s General Chapter – but he failed to attend, claiming to be sick. The General Chapter had word that this abbot was not sick at the time he should have been in Burgundy and decided to rap him across the knuckles. The abbot of Chore (Mainistir na Corann/Midleton) was given the task of calling the abbot of St Mary’s, Dublin, to account. Irish absenteeism from the General Chapter was such that the order decided, after 1195, to allow some leeway to the Irish due to the remoteness of their country – they would only be obliged to attend the General Chapter every four years. Along with the abbot of Chore’s presence at the General Chapter that year,this commission suggests that the abbey of Chore was sufficiently important just fifteen years after its foundation to be given an important role in the Cistercian order in Ireland. However, the real trouble in the Cistercian order in Ireland erupted when the General Chapter sent a mission to Ireland to investigate the rumours of widespread abuses, that is, lack of proper Cistercian discipline. 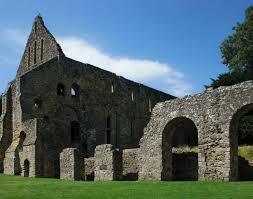 Arriving in 1217, the mission was rebuffed at teh gates of Mellifont and refused admission to the abbey. Jerpoint abbey also refused the mission access, as did several other abbeys. When the Irish abbot of Baltinglass was deposed and an Englishman appointed in his place, the Irish monks in that abbey dragged the interloper from his horse and threw him out. When the abbot sought the assistance of the government and returned with armed men, the monks fortified the abbey against him! It should be noted that of the over thirty Cistercian monasteries in Ireland, nearly two thirds were part of the Mellifont affiliation – all founded by native Irish patrons and filled mostly with native Irish monks. The remaining monasteries founded by the English in Ireland were not affected by this ‘Conspiracy of Mellifont’, as this revolt of the Mellifont affiliation of abbeys was called. Finally, complaining to the pope that the Cistercian rule in Ireland did not extend beyond the wearing of the white habit, the General Chapter decided to crack down severely on the Irish.In 1227, Stephen of Lexington, the abbot of Stanley in Wiltshire, was commissioned with additional papal authority to bring the Irish to heel. Despite threats (verbal and physical) Stephen and his assistants toured Ireland and tried to bring the Irish monasteries into obedience to the General Chapter. The abbeys of Mellifont, Inislounaght and Monasternenagh all fortified themselves against Stephen’s mission. Other abbeys were visited by Stephen’s appointed lieutenants and with great difficulty the deeply damaging and embarrassing revolt was brought to an end. Fifteen of the Irish monasteries were placed under the supervision of foreign monasteries and the Mellifont affiliation was broken up until finally restored in 1274. Tintern Minor (so called because the first monks came from Tintern in Wales) in County Wexford. It was also called Tintern de Voto from a vow made by its founder William Marshal, who was caught in a storm at sea as he crossed to visit his Irish estates. The abbey was founded around 1200 and, after the dissolution, was granted, eventually, to the Colclough family who turned the church into a house – note the very domestic window on the upper wall of the transept. 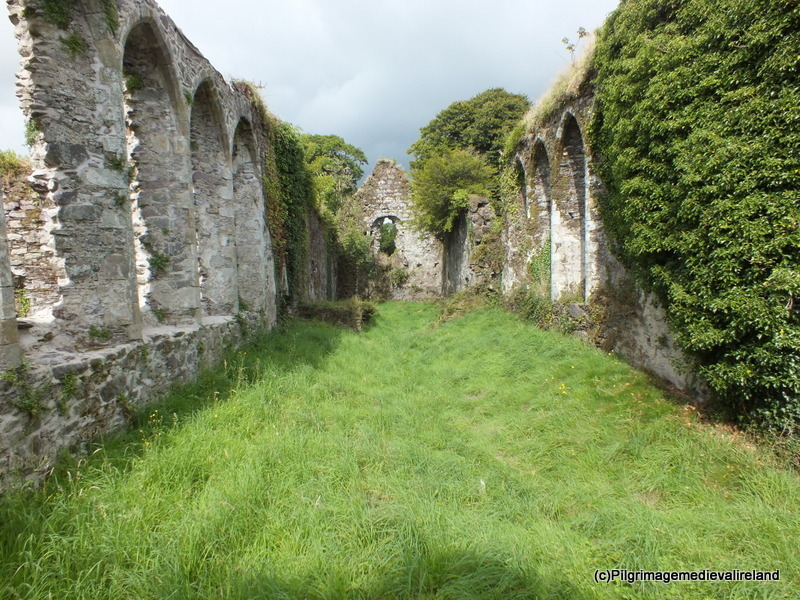 At Mainistir na Corann the trouble was very serious – the abbot of Tintern Minor in County Wexford was charged with removing the abbot of Chore and forcing the abbey to conform properly to the Cistercian rule following a penance. But the abbot and monks of Chore rejected this injunction and continued in their merry way. The abbot of Tintern was obliged to impose an interdict – basically the monks of Chore/Mainistir na Corann were forbidden to celebrate Mass and any other sacraments. They couldn’t even bury their dead with the proper rites! To most people this would have been a terrifying penalty – but not to the monks of Chore – they simply ignored the interdiction! However, the lay people in the parish must have been distressed. Whatever about the private quarrel of the monks with their order, the interdiction also banned ANY sacraments for the laity because the abbey church at Chore/Mainistir na Corann was also the parish church, and the interdiction against the monks also prohibited the celebration of any sacraments in their church. If the laity couldn’t be sure that their dead were condemned to hell or to purgatory (nobody went straight to heaven!) then it was likely that they sought reassurance from the priests at the neighbouring parishes of Ballinacorra, Ballyspillane, Inchinabecky,Caherultan and Mogeesha. This meant that the abbey would have lost out on dues for the sacraments. Eventually with the help of the abbot of Tracton (some miles south of Cork) Stephen of Lexington brought Chore/Mainistir na Corann back into line. As punishment, Chore, like Monasternenagh and Fermoy abbeys, was put under the supervision of Margam Abbey in Wales. The two decades of madness affecting the monks of Chore was at an end, as was the Conspiracy of Mellifont.. The priceless irony of all this was that Stephen of Lexington was elected abbot of Clairvaux in 1242 and was soon removed from office for unsatisfactory performance! Happily his letter to the community at Chore has survived as the oldest letter ever sent to Mainistir na Corann. Bizarrely, like Chore, Fermoy and Tracton, nothing remains of Stanley abbey today. 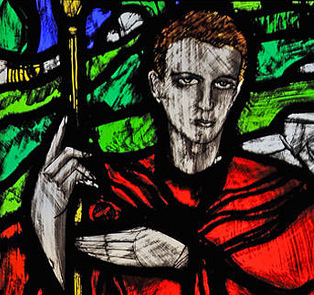 St Elvis and Christianity in Ireland before St Patrick. Propaganda by the scribes of Armagh gives us the story of St Patrick baptizing the King of Cashel. Patrick’s crozier pierced the foot of the king, who thought it was part of the ritual, so he didn’t cry out. This tale was designed to claim that Armagh had primacy over Cashel and the province of Munster. Down here in the deep south of Ireland we celebrate St Patrick’s Day like all Irish people around the world….including elsewhere in Ireland. But there is a very strong tradition in Munster that four saints introduced Christianity to the province before St Patrick arrived. These four were St Ailbe of Emly, St Ciaran of Saigir, St Abban of Moyarny and St Declan of Ardmore. Saint Ibar or Iberius in Latin is sometimes included as a pre-Patrician saint. Window depicting St Ailbe in the Honan Chapel in University College Cork. Each of the windows depicts a saint from Munster. St Ailbe, considered the most important of these, is known in Pembrokeshire as St Eilfyw or Eilfw. The smallest parish in Britain, just four miles north west of St Davids is named after him. He is credited with founding the monastery of Emly, which was later erected into a diocese at the Synod of Rath Breasail in 1111. 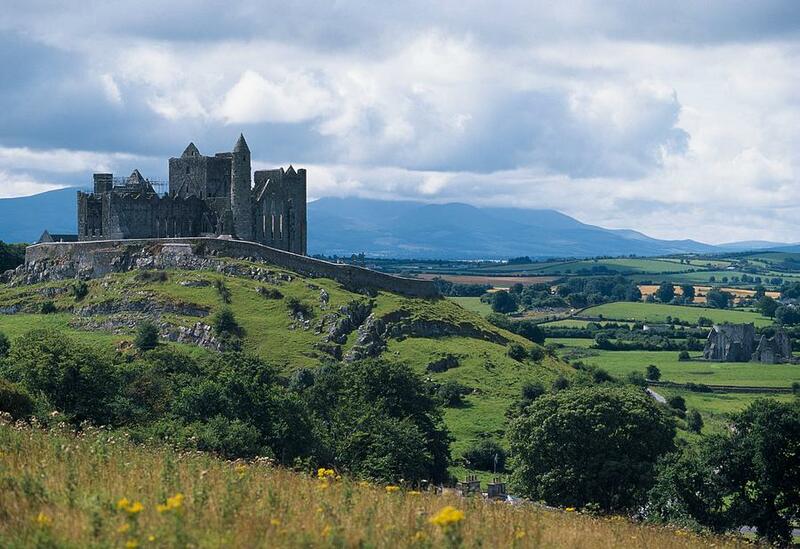 In the eighteenth century the see of Emly was united with the Diocese of Cashel, the see of the Archbishop of Cashel. Ailbe is said to have been a Irish foundling taken back to Wales by some Britons who raised him as a Christian. On a journey to Rome he was ordained by St Hilary, the pope at the time. Ailbe is said to have baptized St David of Wales and then returned to Ireland to set up his monastery. It is ironic that his name is so well known worldwide for the Latin version of Ailbe is…..Elvis! 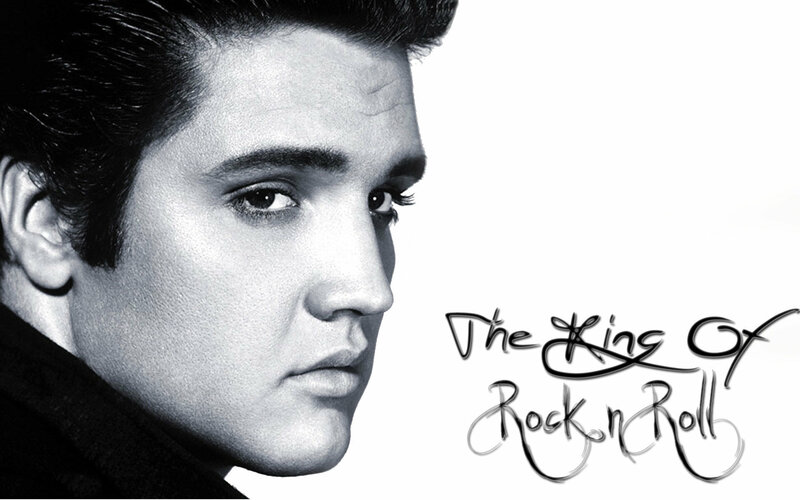 So you now know that the king of rock and roll was named after an Irish saint! But I have no idea if the saint was as good as the king with a guitar. They call him the king, but he’s named after a saint! And an Irish saint at that! Ciaran of Saigir was a nobleman who converted to Christianity and went to Rome on pilgrimage, where he was ordained a bishop by the pope. Returning to Ireland he became bishop of Ossory – a diocese that didn’t exist in the fifth/six/seventh century. He’s called Ciaran the Elder to distinguish him from the St Ciaran who founded Clonmacnoise. The now disused church of St Abban in Killeagh in east Cork. What is baffling is that Killeagh is named after a local woman, St Ia (known as St Ive in Cornwall). Nobody knows how Killeagh got a church dedicated to a Leinster saint. Killeagh lies on the main road from Midleton to Youghal. St Abban was from the area around New Ross in Wexford – a town that was founded in the early 1200s by William Marshal. Abban’s claim to fame is his sister – St Gobnait of Ballyvourney. Abban is said to be buried in Ballyvourney which marks the western outpost of the diocese of Cloyne. The abbey of Abingdon in England claimed to be named after him, but I suspect they were simply making that claim in the hope of acquiring relics. They actually had nothing to do with Abban. 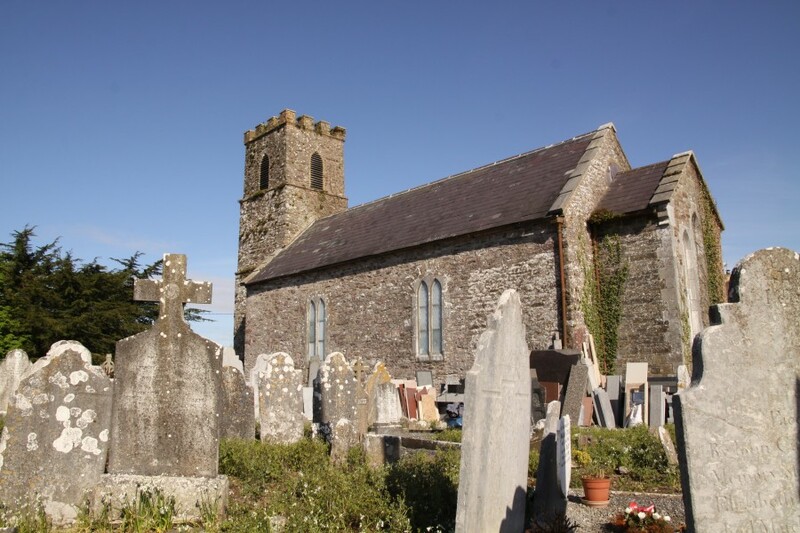 Come to think of it, the village of Killeagh in east Cork – on the road from Midleton to Youghal has a redundant Anglican church dedicated to St Abban – despite the fact that the village takes its name from St Ia (a woman) who gives her name to St Ives in Cornwall. We’re still baffled by the St Abban connection. The lovely ruined cathedral and superb round tower at Ardmore, a site dedicated to St Declan. The man had an eye for good scenery. Ardmore is still a popular holiday resort and remains a virtually unspoiled village in County Waterford. The twelfth century sculpture cycle on the west gable of the cathedral is one of the most important in Ireland. St Declan of Ardmore had the best eye for scenery – Ardmore is a lovely seaside village in the western part of County Waterford which still preserves its tiny ruined Cathedral and its complete round tower. Declan too went to Rome and was ordained by the pope – and met St Ailbe there. 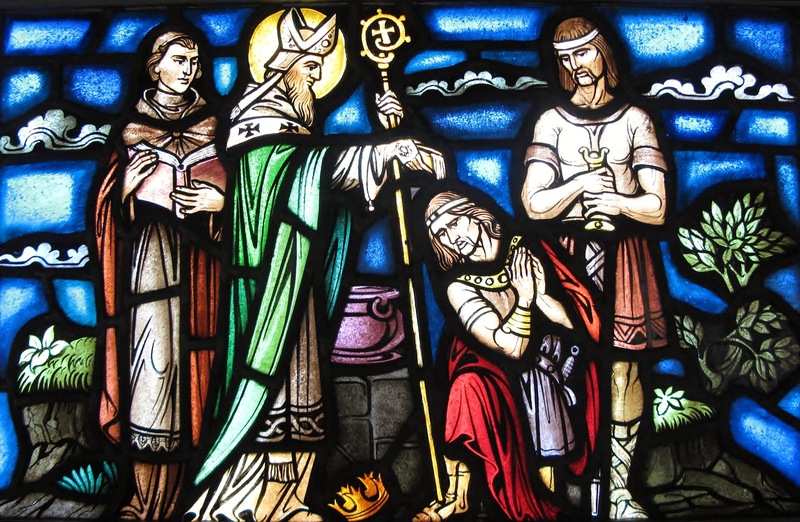 St Declan was considered the patron saint of the Deisi – the people who inhabited western County Waterford. In the modern Catholic parish of Midleton there is a site called Caherultan – said to be the church of St Ultan, a pupil of St Declan. There was certainly a parish church there in the medieval period, but the parish was abolished after the Reformation and the church has vanished. 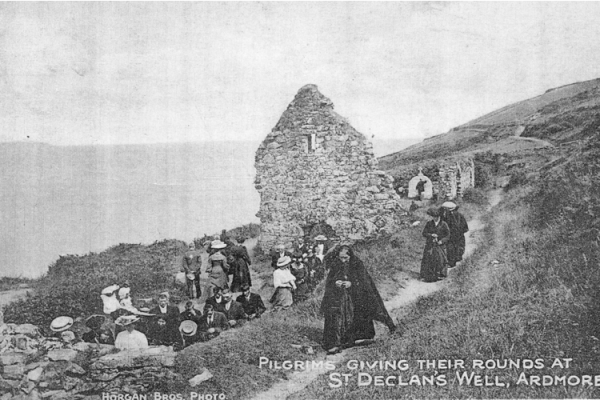 Early twentieth century pilgrims at St Declan’s Well in Ardmore. People still go there to take the water. ‘Doing the rounds’ of the holy sites was a way of imitating the pilgrims Rome who visited the seven basilicas there – not everybody could go to Rome on pilgrimage. Now I don’t expect you to believe all the above stories, for many of them originate as anti-Patrician propaganda written to counter the claims of the church in Armagh to primacy over the whole of Ireland in the 7th and 8th centuries. But there is an interesting grain of truth in several of them. However, the most important detail to remember is that the south of Ireland had a lot of connections with Britain, especially Wales and with Gaul (now France). The evidence for this comes from both ancient Irish sources and ancient Welsh sources, as well as the presence of Irish inscriptions in ogham script on stones in Wales and Cornwall. Indeed the Ui Liathain and their neighbours to the east, the Deisi even colonised parts of South Wales as the Roman Empire began to contract in the late 300s and early 400s. The Ui Liathain ruled the area that corresponds to south-east County Cork from the Blackwater to the sea and from the Glanmire River to the lower Blackwater. It is ironic that their lands were later settled by Milo de Cogan and Robert FitzStephen and their followers from Wales – the Barrys, the Carews and the FitzGeralds. The Deisi territory in Waterford was colonized by the Powers and the FitzGeralds. What these stories of the saints suggests is that there was much interchange of goods,persons (including slaves) and ideas between the south coast of Ireland and Wales. Christianity was one of the imports into Ireland – it survived in Wales after the collapse of the Roman Empire and the colonization of England by the Angles and Saxons. Indeed, when we consider that the Laigin (or peoples of Leinster) even colonized the Lleyn peninsula in north-west Wales, giving their name to the place, we must wonder if the southern half of Ireland was heavily Christianized before the arrival of St Patrick. Modern scholars now believe that Patrick operated north of a line from Galway in the west to Dublin in the east. He didn’t come south of that line because Christianity was already well established in the south, with bishops supervising the church there. A stray bishop would NOT have been welcomed by the southern bishops! Palladius was appointed the first bishop to the Irish believing in Christ in 431 – clearly there were enough Christians in Ireland by this date to warrant the appointment of a bishop. St Patrick is traditionally said to have arrived in 432, but modern scholars reckon he came later and that 432 marked the arrival of Palladius. The scribes of Armagh may have appropriated details from the life of Palladius and attributed them to Patrickd whilst at the same time ‘disappearing’ Palladius from Irish history. And then there is the reference in Prosper of Aquitaine’s Chronicle: in 431 Pope Celestine sent Palladius as bishop to the Irish believing in Christ. The crucial thing about Prosper was that he was a contemporary of the two men mentioned in that statement. He was an eyewitness to these events. Prosper wrote his Chronicle to tell the story of how the Pelagian heresy was put down by St Germanus of Auxerre, and others. This heresy had flourished in Britain, alarming the Catholic Church and it probably prompted the decision to appoint Palladius to minister to the Irish Christians as their first bishop. This was an extraordinary decision because Palladius had to leave the jurisdiction of the Roman Empire to take up his new post. It is very likely that Palladius (a Gallo-Roman) was indeed the first bishop in Ireland, preceding St Patrick by several years. 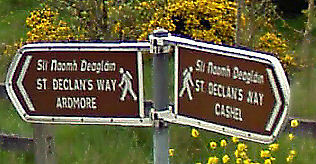 Modern pilgrimage in Ireland. There is now a walking trail from Ardmore to Cashel, linking St Declan to St Ailbe. It’s a sort of secular Camino – Irish style. Instead of sun, sangria and tapas, you get rain, Guinness and Tayto crisps! Poor Palladius! He was condemned as a failure and almost entirely written out of Irish history centuries later when the scribes of Armagh were trying to claim for St Patrick the credit for converting the Irish to Christianity. The real goal of these scribes was to make Armagh the paramount church in Ireland. But you have got to hand it to them – it was brilliant propaganda! Now the whole world believes that Patrick was Irish and nobody has heard about Palladius, who probably did much to consolidate Christianity in the south of Ireland. Even Stalin, with his retouched photos during the purges, was a mere amateur by comparison. And at least nobody died in Ireland! Ah well, A Happy St Patrick’s Day to you! Someone really needs to explain the non-existent relationship between the Cistercian monks who founded Mainistir na Corann and the Anglo-Normans who’d just invaded Cork. All will be revealed in a free public local history lecture on Friday 20th March at 1.00 pm in Midleton Library. Recently I discussed with Mary Mitchell in Midleton Library the idea of a free public lunchtime local history lecture/talk. We can now reveal the date and topic of the lecture. The lecture is called Mainistir na Corann – of monasteries, mad monks and the medieval origins of Midleton. It will be presented by yours truly (yes, Tony Harpur himself and in the flesh!) in Midleton Library at 1.00 pm on Friday 20th March. The lecture is expected to last no longer than 45 minutes. The lecture will cover the years c.1177 to c.1624 and will focus on the twelfth century religious and political context of the foundation of the Cistercian abbey of Mainistir na Corann/Chorus Sancti Benedicti. It will go on to describe what we know fo the recorded history up to the dissolution under Henry VIII. The final part will be a teaser for a future lecture discussing the origins of the TOWN of Mainistir na Corann which became Midleton in 1670. The aim of this lecture is to inform, correct misinformation, and to reveal new material based on recent studies. As a bonus after the lecture, I may even take some of the audience to see a stone I’ve discovered that appears to have come from the abbey! The Red Picnic in Mogeely – mass murder in 1182. Cashel, an ancient site of great importance to the MacCarthys. The title ‘King of Cashel’ was synonymous with ‘King of Munster.’ The Rock of Cashel is effectively the emblem of Munster. In the most important account of the twelfth century English invasion of Ireland, the author, Gerald de Barri, or Gerald of Wales also called Giraldus Cambrensis, tells several stirring and bloody tales. Few are more brutal than the tale of a mass murder in Mogeely in 1182. In his book Expugnatio Hibernica (the Conquest of Ireland),, written about 1187, Gerald tells us that when Robert FitzStephen and Milo de Cogan had ruled Cork for five years, Milo set out for a parley in Lismore with Ralph, the illegitimate son of FitzStephen, and five knights. They broke their journey at Mogeely, with fatal consequences.. The reference to a parley with the men of Waterford suggests that there was between the English in Waterford and the English in Cork at the time, but it seems that the whole point of going to Lismore was to parley with the Waterford men there and NOT at Mogeely. So the reference is very likely a mistake. The small peaceful village of Mogeely is located over a mile and a quarter north of Castlemartyr. Both villages are in the same Roman Catholic parish, and although Mogeely is the smaller of the two villages, it boasts the grander church, completed in 1912. It also boasted a railway line, until it finally closed in the early 1980s, and a modern creamery, celebrated for its unique regato cheese! So what was the background to the ‘Red Picnic’ of Mogeely? When the Anglo-Normans invaded Cork in 1177, Mogeely was the residence of the local lord of Imokilly, a chieftain called Mac Tire. This is actually a patronymic or surname, since we don’t even know the man’s personal name. Mac Tire ruled Imokilly, which in those days did not correspond to the modern barony of Imokilly. The old Imokilly of the twelfth century stretched from the western shore of Great Island, where Cobh (the former Queenstown) now stands, to a line running from north to south somewhere between Mogeely and Killeagh. The area east of this line, as far as Youghal, would later be incorporated into Imokilly, while Great Island, and the civil parish of Mogeesha just west of Midleton, would be lost to Barrymore. In 1177 there was serious trouble in the province of Munster. Since the so-called Treaty of Glanmire in 1118, the province had been divided into two distinct kingdoms, with a disputed area to the east. In the south, stretching from Lismore to Brandon in County Kerry, was the kingdom of Desmond, which the Anglo-Normans called the kingdom of Cork, from its capital city. This was ruled by the MacCarthaig or MacCarthy family, and the incumbent king in 1177 was Diarmait MacCarthy. He had succeeded his father in 1151 and managed to restore the much reduced power of his family in the area. The so called Treaty of Glanmire divided Munster into two kingdoms. North Munster or Thomond was ruled from Limerick by the O’Briens. South Munster or Desmond was ruled from Cork by the MacCarthys. East Munster or Ormond was disputed between the two. The man who imposed this division was Turlough O’Connor, King of Connacht, and aspiring High King of All Ireland. The division aimed to reduce the O’Briens and MacCarthys to the status of lesser kings. The trouble in Ormond was probably a useful distraction for O’Connor. 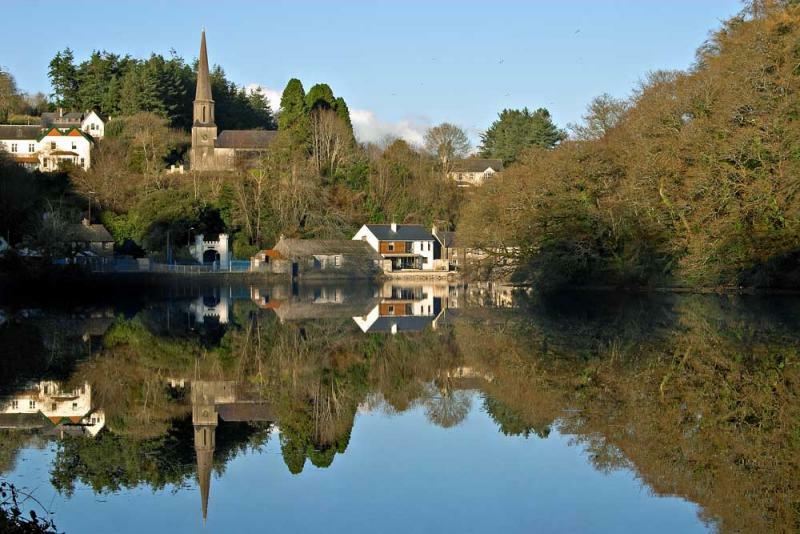 Glanmire is today a quiet and peaceful village in a steep-sided wooded river valley just east of Cork. In the north lay the kingdom of Thomond stretching from North Tipperary to the Cliffs of Moher in Clare, but also including Limerick city and some newly secured territories in modern County Limerick. The ruler of Thomond in 1177 was Donal O’Brien. King since 1168, Donal was a direct descendent of the famous Brian Boru who died just a millennium ago during the celebrated battle at Clontarf (1014). The O’Briens, a feisty and ambitious family, were considered jumped up upstarts by the MacCarthys. The third area of Munster was Ormond (literally, East Munster) which effectively corresponded to the modern county of Tipperary. This territory was bitterly disputed between the O’Briens and the MacCarthys, because the MacCarthys were descended from the ancient kings of Cashel and had Diarmait MacCarthy’s grandfather, Cormac MacCarthy, had trounced the O’Briens in the 1120s, and secured possession of Cashel, County Tipperary, where he built Cormac’s Chapel, the most important building on the Rock of Cashel. It was probably Cormac who created the modern diocese of Cloyne in contravention of the Synod of Rath Breasail (1111) which had extinguished the older bishopric of Cloyne. Cormac MacCarthy’s greatest work was his royal chapel. Cormac’s Chapel on the Rock of Cashel was completed in the 1130s with the assistance of craftsmen sent from Germany by an Irish abbot in Regensburg. It does look very Germanic from some angles and it revolutionized Irish architecture in the twelfth century, virtually creating the Irish romanesque style in one go. The large church behind the chapel is the thirteenth century gothic cathedral. By 1177 the festering disputes between the O’Briens and the MacCarthys had erupted into open war again. The reason was that King Donal O’Brien had expelled the group of families called the Ui Fidgente from their ancestral lands in the middle of the modern county of Limerick. This finally achieved the long sought O’Brien ambition of bringing the whole territory west of Limerick city under their own control – they had already tried it when Turlough O’Brien had founded Monasternenagh Abbey on lands he had won from the O’Donovans in 1148. The Ui Fidgente families were long-standing allies of the MacCarthys, who gave them shelter in other parts of their kingdom of Desmond. This is how the O’Donovans, for example, came to be settled in South-West Cork. 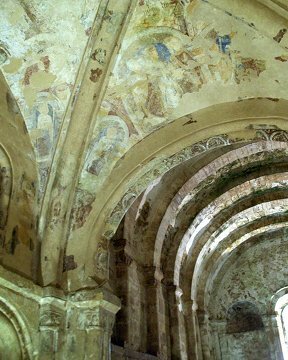 The interior of Cormac’s Chapel was covered in frescoes and painted stonework. These are the finest surviving medieval fresco fragments in Ireland. They were preserved by the local people who had a custom of whitewashing the interior of the chapel over many centuries. It should be pointed out that the exterior of the building was very likely painted in bright colours too! It is not known if King Henry II of England saw this dispute between Thomond and Desmond as a opportunity, but in 1177 he decided that three men would be awarded license to conquer the ‘kingdom of Cork’ and the ‘kingdom of Limerick,’ as the Anglo-Normans called the two territories. Milo de Cogan and his relative, Robert FitzStephen, who would divide Cork between them, but would reserve the city and one cantred for King Henry. Philip de Braose was licensed to take Limerick.The contemporary historian of the Anglo-Norman invasion of Ireland, Gerald de Barri, or Geraldus Cambrensis (Gerald of Wales), wrote that the three men and their knights and men-at-arms sailed first to Waterford where they disembarked. They then travelled on foot and by horse to Lismore, which was clearly intended as the launch point. Lismore was the seat of a bishop (and papal legate) but it also seems to have been a private estate of the king of Desmond. Very rapidly the party seized the eastern and central parts of Cork, especially around the harbour. Curiously, Geraldus does not mention any fighting during this invasion. King Diarmait MacCarthy decided to play for time and abandoned his city, moving further west. Once they had secured their lands in Cork, Milo de Cogan and Robert FitzStephen decided to take their men north to help Philip de Braose to capture Limerick. But this expedition foundered when the citizens burned their city and de Braose lost heart. The square apse for the altar in Cormac’s Chapel. The whole building is constructed of stone. Even the steeply pitched roof is built of stone using the ancient Irish corbelling technique found as early as Newgrange. Cormac’s Chapel marries Continental romanesque barrel vaults with native Irish construction ideas, thus creating a totally new indigenous interpretation of romanesque architecture. On returning to Cork, de Cogan and FitzStephen began to sub-infeudate their lands. That is they divided it up into estates which they granted to their relatives and their followers. The cantred of Ui Liathain, now called the barony of Barrymore, was given to Philip de Barri, brother of Gerald de Barri whose book Expugnatio Hibernica is the most celebrated contemporary eyewitness account of the whole Anglo-Norman invasion of Ireland. However, Philip was not in Ireland at the time but in Wales, and according to Geraldus, Robert FitzStephen’s illegitimate son Ralph ‘stole’ the lands of Ui Liathain from de Barri. What is so interesting about this comment by Geraldus is that he does not attempt to hide the sheer greed and chicanery of the men who invaded Ireland. Mind you, his book contains a lot of family propaganda – the de Barris and their relatives the Carews could do no wrong in his eyes. Geraldus tells us that for five years Milo de Cogan and Robert FitzStephen ruled the kingdom of Desmond in peace after their invasion. Both men used their influence to restrain the rash behaviour of younger,wilder men in their respective parties. This was important, because a peaceful land would attract settlers from England and Wales. However all that changed dramatically in 1182. However it is not certain how much this peace extended to the displaced native Irish lords. Milo de Cogan, and his newly married son-in-law, Ralph, son of Robert FitzStephen, and a party of knights set out to visit Lismore for a meeting. They travelled by way of Mogeely, the home of the former ruler of Imokilly, MacTire, now reduced to being a token local Irish landholder. This is the context for the mass murder of the English in Mogeely. What does come out in Geraldus’s statement is that the Anglo-Norman party consisted of seven knights (Milo, Ralph and five others), but we don’t know how many men-at-arms and archers travelled with them on foot or horseback. The medieval manuscript known as MacCarthaigh’s Book gives an Irish account of the incident with the additional information that ‘slaughter was inflicted by the family of O MacTire.’ The ‘Red Picnic’ was a family affair – but not quite in the usual way of family picnics. The reference to ‘slaughter’ is common enough in the Irish Annals – you can slaughter a single individual or several people, the use of the word implies an element of butchery. In this case it might also support the idea that more than seven Anglo-Normans knights were given the battle-axe treatment in Mogeely. Clearly the Anglo-Norman party were relaxed and expected no trouble from MacTire – after all they were sitting in a field, with their guard down. Indeed I suspect that the party didn’t even post guards. 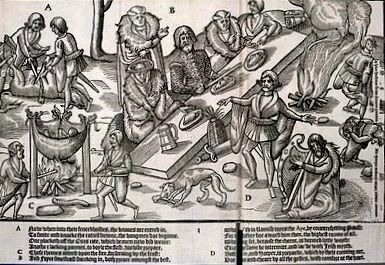 An outdoor feast of the MacSweeney chief of County Donegal depicted in a English woodblock print from the sixteenth century. The chief and his wife are accompanied by two friars (note the tonsured heads) and another figure. The food is being prepared behind them – a wild boar is being butchered and boiled in a leather cauldron on the left foreground. The entertainment is provided by a bard reciting or singing to the accompaniment of a harp. The entertainment is enhanced by the two figures displaying their bare backsides to the chief’s table – they are professional farters! No wonder the entertainment is held outdoors! Was the butchery in Mogeely done just before a meal like this? Were they having a picnic? I know that sounds silly, but it is actually possible that they were taking a quick bite to eat and a drink. Remember, during the twelfth century the main meal of the day was eaten in the early afternoon, in broad daylight. We don’t know what time of the year the massacre happened but it must have been during some dry and warm weather – even today you simply wouldn’t sit on wet grass or muddy ground in Ireland. Indeed there are illustrations from the sixteenth century of Irish chiefs having a feast outdoors, and one can easily imagine the same happening in the late twelfth century. If the weather on this occasion was indeed dry and warm then the break would have been necessary for men who were probably wearing chain mail or, at very least, leather armour, and it may have been their first stop since leaving Cork earlier that day.. Anybody who has ever lifted a mail hauberk or jacket will be aware of the sheer weight of it, and even a leather jacket can bring on a sweat on a warm day in an Irish summer. Another thing to note about the above account is that Anglo-Norman knights on foot were very vulnerable attack by ferocious Irish enemies wielding two handed battle axes. It was the armoured knight on a trained warhorse who terrified the Irish. Geraldus is clearly furious at this mass murder, calling MacTire a traitor. This would be true if MacTire had been allowed to keep his personal lands in return for some fealty exacted from him by FitzStephen. However the Irish Annals of Lough Ce mention the murder with some jubilation at the death of Milo de Cogan, suggesting that there was really no love lost between the Irish and the Anglo-Normans. The whole incident might lead you to imagine that the Red Picnic in Mogeely was an isolated local feud, but in fact it proved to be deadly serious – and not just for the victims. 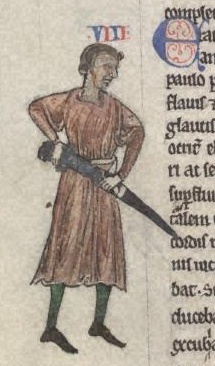 Raymond le Gros as depicted in a thirteenth century copy of the Expugantio by Geraldus. He was simply the best general the Anglo-Normans had in Ireland, getting them out of many a difficult situation time and time again. The Red Picnic in Mogeely sparked off at least two decades of trouble and warfare for the Anglo-Normans as they tried to regain secure control of the land they had taken during the invasion of Cork in 1177/1178. Raymond le Gros did crush the initial revolt in 1183, but it seems that Robert FitzStephen was trapped in Cork city and may even have died there by the time Raymond had arrived. Raymond embarked at Waterford with twenty knights and two hundred men-at-arms, half mounted and half on foot. Sailing directly to Cork he relieved the city. 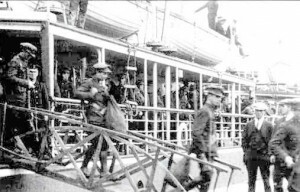 There is a priceless irony in the fact that, during the Irish Civil War in 1922, the new Free State Army performed almost exactly the same action as Raymond, with the assistance of the Royal Navy, who were based in Cork Harbour. Like Raymond, the Free State Army sailed from elsewhere in Ireland (Dublin actually) directly to Cork and managed to secure Cork for the Dublin government and eventually put down the Republican forces in Munster. The greatest irony of the Irish Civil War (1921-1923) was that the army of the new Irish Free State repeated Raymond le Gros’s sea voyage to Cork in 1183 to put down a revolt sparked off by the massacre in Mogeely. In 1922 the Free State was trying to regain control of Cork which was in the hands of hard-line Anti-Treaty Republican forces. Raymond was soon joined by his cousin, Richard de Cogan, who came with a picked force sent by King Henry. When some of the Irish leaders were killed and their forces driven off, it seems that a measure of peace had temporarily returned to the area. At the end of February (1183?) reinforcements led by Philip de Barri also arrived. Philip had come to secure his estates in Ui Liathain, the area from Carrigtwohill in the south to Castlelyons in the north, from the Glanmire river in the west to Conna in the east.. Along with Philip came his brother Gerald – the very historian we’ve quoted above. Philip’s descendants gave us the Irish family name Barry. Raymond le Gros established his nephews as the Carew family in Cork, while Richard de Cogan gave us the still current surname of Cogan in County Cork. It was really only in the years from 1206 to 1220 that the Anglo-Norman settlement of East Cork could get underway and set down firm roots, and even then Tadgh MacCarthy invaded Imokilly in 1216 and burned Cloyne. The medieval effigy that marked the supposed tomb of Raymond le Gros in Molana Abbey near Youghal. This drawing was made in the late 18th century by Daniel Grose and is preserved in the Royal Irish Academy. Sadly the effigy has since disappeared. Diarmait MacCarthy died in 1185 but was immediately succeeded by his equally warlike son Donal, who would invade Imokilly with ferocious intent in the 1190s, burning all the castles there, including Castra na Chore or Ballinacorra, another castle that may have given Castleredmond townland its name and a castle at Mogeely. Donal MacCarthy’s death in 1206 seems to have eased the pressure on the Anglo-Normans in East Cork, allowing for settlement to begin there. The MacCarthys, of course, are almost two a penny in Munster, especially in Cork. And the MacTire family, onetime lords of Imokilly, what did the Red Picnic do for them? By 1300 they had been reduced to the condition of local robbers, but their descendants are still around – their name is now Woulfe. Somehow it seems appropriate given the blood soaked picnic they perpetrated one fine day in a field near Mogeely in 1182. The ruined Augustinian church of Molana Abbey, near Youghal, where Raymond le Gros was buried sometime between 1185 and 1198. Founded as Dairinis in the 6th century, ithis site is celebrated as the place where the Collectio Canonum Hibernensis was compiled in the 8th century. This is one of the oldest compilations of Canon Law anywhere. Note: the texts quoted in italics in this post were taken from pages 187 and 189 of the translation attached to the definitive version of the Expugnatio. A.B.Scott & F.X.Martin, editors: Expugnatio Hibernica – The Conquest of Ireland by Geraldus Cambrensis. Royal Irish Academy, Dublin, 1978. As for the Imokilly Regato Cheese PDO produced at Mogeely: here’s a link to show that this Italian style cheese is indeed made in East Cork and even has a product denomination (PDO) from the European Union! And no, Kerrygold is NOT a sponsor of this blog! Before Midleton – the foundation of Mainistir na Corann in 1180: a medieval whodunnit. 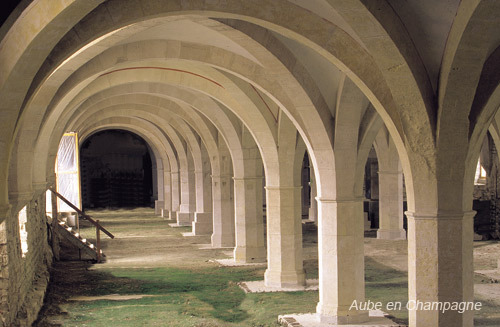 Sadly, this splendid undercroft is not the remains of the abbey that gave Midleton its Irish name – this is Clairvaux Abbey in Burgundy, France. Here St Malachy of Armagh met St Bernard of Clairvaux, the abbot, and negotiated the introduction of the Cistercian order into Ireland. This abbey is where Malachy died in St Bernard’s arms in 1148. 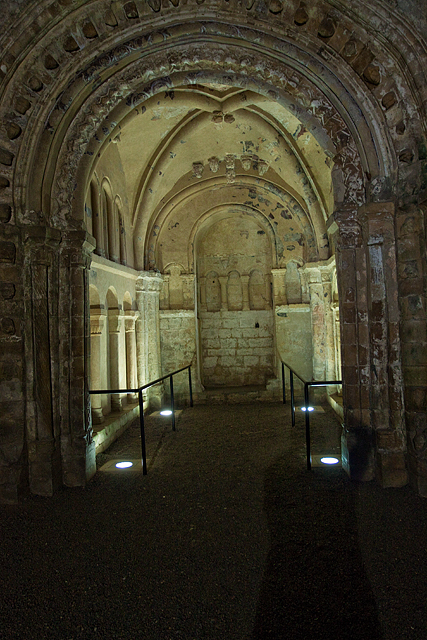 Today, much of Clairvaux is a high security prison, although it is now possible to visit the surviving monastic remains. 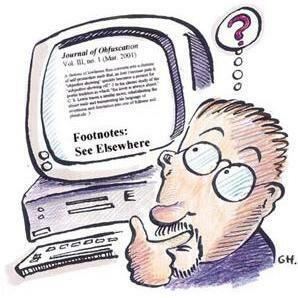 Sadly, in Paul MacCotter’s words, this foundation has been the subject of ‘much rubbish and some good history.’ The rubbish is too often repeated as ‘history’ today by people today because they are generally unaware of the failings of the common source of their ‘information’. Much of what people pass off as ‘information’ on medieval history of a location is derived from Samuel Lewis’s Topographical Dictionary – in an earlier post, I warned about relying too much on that particular source! Curiously, at very least since 1945, there really has been no justification for anyone to repeat the Lewis nonsense. In that year the Journal of the Cork Historical and Archaeological Society published a whole issue on the barony of Imokilly. Included in the issue was a fine article by Denis O’Sullivan on the medieval religious houses of Imokilly. One of O’Sullivan’s aims appears to have been to resolve some of the issues surrounding the history of the abbey at Chore (Midleton), and he paid particular attention to the foundation of the abbey. I suspect he was as underwhelmed as your present author is about the reference by Lewis to a ‘Barry Fitzgerald’ as the founder of Chore Abbey (Midleton). In this post I will attempt to identify the principal founding patron of the abbey of Chore (Midleton). To do this I will take on board the results of Denis O’Sullivan’s careful analysis of the surviving evidence pertaining to the origins of the abbey. First we must establish some basic information about the abbey. Various sources, but especially the seventeenth century scholar, James Ware, tell us that the abbey was founded at Chore in 1180. Sadly, the second fact is an omission: the name of the founder is not given by Ware. This is unusual, for Ware was a good historian and, because scholars like him preserved so much information, we generally know who founded what in medieval Ireland. The third detail to note is that the monks came from Monasternenagh Abbey in County Limerick (the Nenay or Maigue of the Latin text quoted above) – a critical detail the importance of which has been too often underestimated when discussing Chore (Midleton). The fourth detail is the distinction drawn by Paul MacCotter between the initial Anglo-Norman invasion of the kingdom of Cork in 1177/1178 and the later Anglo-Norman settlement of the conquered territories. This brings us back to the first fact above – the foundation year of 1180. You may recall from previous discussions about Ballinacorra that the Anglo-Norman settlement of south-east Cork was not secured until about 1220. The abbey at Chore was well established by then. Interestingly, MacCotter isn’t the first scholar to make this distinction between conquest and settlement – Denis O’Sullivan made exactly the same point in 1945. When monks were sent out from one monastery to establish another the new monastery was described as a ‘daughter’ of the monastery that supplied the original monks. The original monastery was considered to be the ‘mother’ house. Thus as the ‘daughters’ of Mellifont provided monks for further monasteries, they helped to create the Mellifont filiation – from the Latin filia or daughter. This was an alliance or affiliation of monasteries that acknowledged Mellifont’s seniority and even permitted it to act as a guardian of their interests. This monastic filiation or alliance is the critical detail here – it entirely undermines all attempts to attribute the foundation at Chore (Midleton) to the Anglo-Normans. And, oddly, it is a fact the importance of which has been ignored by so many people. So, how does Denis O’Sullivan reveal the evidence for the Gaelic Irish origins of the Abbey of Chore? He looks at the writings of James Ware’s De Hibernia et Antiquitatibus Eius (London, 1654), Mervyn Archdall’s Monasticon Hibernicum (Dublin, 1786) and Louis-Auguste Allemande’s Histoire monastique d’Irlande (Paris, 1690). O’Sullivan makes it clear that Ware (the earliest of these scholars) never revealed the name of a founder of the abbey of Chore – even in his unpublished manuscripts. Indeed in one of his manuscripts Ware notes that the Barrys were patrons of the abbey – but in the same sentence they are NOT named as the founders. This seems to have been where the confusion arose – because the Barrys of Barrymore were patrons of the abbey at the dissolution, Allemande and Archdall assumed the Barrys (or the Fitzgeralds) were the founders. This idea was picked up by Smith and others, including Lewis, giving us the bizarre Barry Fitzgerald attribution. But back to the history of the foundation of the abbey of Chore (Midleton). How did it come about and who was the founder? Firstly,we must briefly note the twelfth century (1101-1200) reforms in the church in Ireland. This was part of a general European church reform in matters of discipline and organisation. The Irish church, beginning in 1101, but especially with the synod of Rath Breasail in 1111, was remodelled into a diocesan structure following the Continental model. Part of the reform included establishing clearly defined territorial dioceses – a nightmare in a country with shifting political boundaries. Within these dioceses parishes were created to minister to the local communities. These usually consisted of several townlands – see our previous posts on this topic. These medieval parishes were still being created up to and after the year 1200, but historians believe that most parishes were created by that date. These parishes survived the centuries as the famous Civil Parishes on the first edition Ordnance Survey map (mid-1800s) – they were ‘civil’ because they represented the parishes of the state church that was created following the Reformation. They are still an important reference point for genealogists in Ireland. The parishes were grouped into rural deaneries. One such deanery was Imokilly. This was simply an ecclesiastical administrative structure within the diocese – it need not detain us any further. The ruins of the lavabo or hand-washing place in the cloister of Mellifont. The remains of the mother house of most of the medieval Cistercian monasteries in Ireland were ravaged by quarrying after the abbey was dissolved in the reformation. Mellifont was founded at the southern extremity of the diocese of Armagh in 1142 by St Malachy of Armagh. The first monks came directly from Clairvaux. Another important result of the twelfth century reforms was the introduction of Continental religous orders into Ireland. The Augustinians seem to have been the first to be introduced. But in 1142, St Malachy of Armagh introduced the Cistercians directly from Clairvaux, with the blessing of St Bernard of Clairvaux, the greatest of the Cistercians, and one of the most influential religious leaders in twelfth century Europe The importance of this can hardly be overstated, because the Cistercians influenced church architecture in medieval Ireland to an extraordinary degree. The Abbey of Mellifont in County Louth, founded by St Malachy in 1142, very quickly produced offspring by providing monks to found new Cistercian houses elsewhere in Ireland. One of these new foundations was the abbey of Monasternenagh, founded in 1148, near Croom in County Limerick. In the same year, our old friend Diarmaid McMurrough, King of Leinster, founded a Cistercian monastery at Baltinglass in County Wicklow with monks from Mellifont. 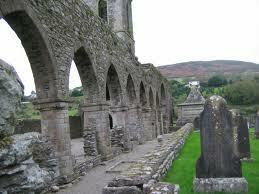 Baltinglass would send out monks to found Abbeymahon monastery in County Cork in 1172. This was the same Diarmaid McMurrough who may have sailed from Imokilly to bring the Anglo-Normans to Ireland in the 1160s! Monasternenagh, near Croom in County Limerick, was founded in 1148 by Turlough O’Brien on lands taken from the O’Donovans. The first monks came from Mellifont. This was the mother house of Chore (Midleton). 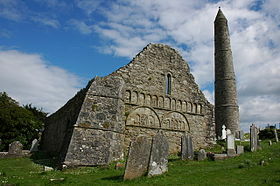 Monasternenagh may have been founded to celebrate Turlough’s crushing defeat of the O’Donovans. This victory allow the O’Briens to secure their authority over what is now County Limerick. Turlough’s vicitory a serious setback for the MacCarthys, the rivals of the O’Briens for the dominance of the province of Munster. Monasternenagh (Mainistir an Aonaigh – the Monastery of the Fair – it was built on an ancient fairground, in Latin it was called de Magio – of the Maigue, from the river bordering the site) was founded by Turlough O’Brian, king of Munster from 1142 to 1167. 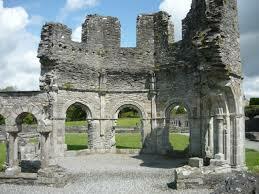 However, Monasternenagh was not founded on O’Brien lands. Turlough O’Brian had recently defeated the O’Donovans and took some of their most valuable lands to provide a site, and an endowment, for his new Cistercian monastery. It should be noted that founding a monastery of this type in Ireland at the time advertised the founder as a modernising reformer of the church in Ireland. The O’Donovans were long standing allies of the MacCarthys, kings of Desmond or Cork, and rivals of the O’Briens. By founding Monasternenagh Abbey on O’Donovan lands, Turlough O’Brien meant to ensure that that the O’Donovans could never recover their ancestral lands! Turlough’s son, Donal Mor O’Brien would later drive out the O’Donovans and their allies for good, sending the O’Donovans to south west Cork. It is worth noting that Monasternenagh may actually have been founded to mark an important victory – just as William the Conqueror built Battle Abbey on Senlac hill, the site of his victory over King Harold at the Battle of Hastings. Battle Abbey was founded by William the Conqueror to celebrate his victory over King Harold at Hastings in 1066. The O’Brien kings appear to have followed this idea of founding religious houses on or near the site of their victories. Within a few decades, the community at Monasternenagh provided monks for new foundations – Inishlounaght and Holy Cross in County Tipperary, and Chore (Midleton) in County Cork. Inishlounaght soon provided monks to found the abbey of Fermoy in the diocese of Cloyne in 1170. Ten years later, Monasternenagh provided monks for both Holy Cross and Chore (Midleton). Intriguingly, it seems that Holy Cross seems to have been founded in exact imitation of William the Conqueror’s Battle Abbey, for Holy Cross abbey stands on or very near the site of the battle of Thurles (1174) where Donal Mor O’Brien, king of Thomond, inflicted the first defeat on the Anglo-Norman invaders. It was certainly founded in imitation of Monasternengah, which was itself founded by Donal’s father, Turlough, to celebrate a victory over the O’Donovans. Clearly there was a pattern to the O’Brien policy of founding such religious houses, but it is the later history of Holy Cross that provides interesting parallels with Chore (Midleton). Baltinglass Abbey in County Wicklow was founded in 1148 by Diarmait MacMurrough – the man who brought the Anglo-Normans to Ireland. This abbey was founded in the same year as Monasternenagh, which was also the year in which St Malachy of Armagh died at Clairvaux. Now it is important to remember that there were only four Cistercian monasteries in County Cork – two were founded in the diocese of Cloyne (Fermoy and Chore) the others were Abbeymahon (1185, diocese of Ross) and Tracton (1224, diocese of Cork). Abbymahon was founded from Baltinglass by Diarmaid MacCarthy in 1185, so it was a part of the Mellifont filiation. However, Tracton, the last of the medieval Cistercian monasteries created in Ireland, was founded by the Anglo-Norman Odo de Barry in 1224. Tracton’s founding monks came from Whitland in England. This is the critical detail to keep in mind – the Cistercian abbeys founded in Ireland by the Anglo-Normans drew their founding monks directly from either England or Wales and they remained culturally English until the dissolution. In the 1200s Inislounaght would be poacned from the Mellifont filiation and placed permanently under the abbey of Furness in England. Thus two groups of Cistercian monasteries developed in Ireland – native Irish foundations, almost all of which were linked to Mellifont, and the English foundations which admitted no Irish monks. 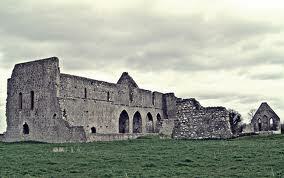 Of the thirty-six Cistercian abbeys in medieval Ireland, twenty-seven were affiliated to Mellifont. All the others were founded by the Anglo-Normans from English and Welsh monasteries and were affiliated to English and Welsh monasteries. Holy Cross Abbey near Thurles in County Tipperary was founded in 1180, the same year that Chore Abbey (Midleton) was founded. This abbey was established by Donal Mor O’Brien, King of Thomond, the son of the Turlough O’Brien who founded Monasternenagh in 1148. Like his father, Donal wished to commemorate a victory in battle, in this case the Battle of Thurles in 1174, when he inflicted the first real defeat on the Anglo-Normans during their invasion of Ireland. Ironically, Donal Mor O’Brien was a relative by marriage of Diarmait MacMurrough, who brought the Anglo-Normans to Ireland! And this is Denis O’Sullivan’s most important point in his 1945 article. 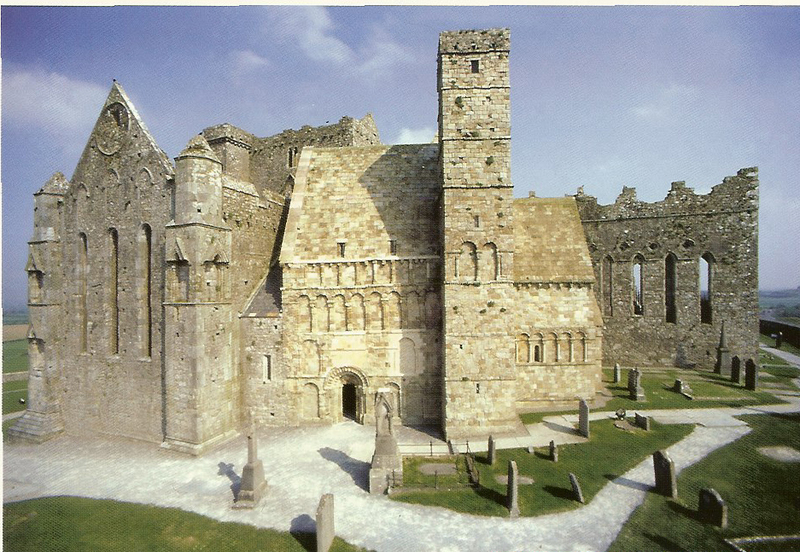 The Cistercian monasteries founded in Ireland by the Anglo-Norman were NOT linked to Mellifont. 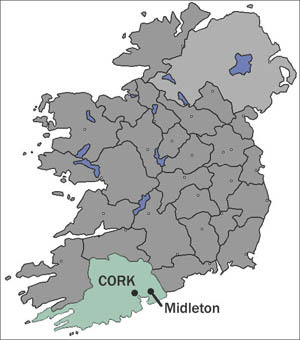 Chore (Midleton) was linked to Mellifont, because it was founded from Monasternenagh which was itself founded from Mellifont in 1148. In effect, Chore (Midleton) was a grand-daughter of Mellifont – and the majority of its abbots whose names are recorded were native Irish..One other thing we must do is consider Paul MacCotter’s useful division of the early Anglo-Norman period in Ireland into a conquest phase and a settlement phase. This division is matters because there could be several years between the initial conquest and parcelling out of conquered lands, and a determined Anglo-Norman settlement in those lands. So now we know that Chore (Midleton) was a native Irish Cistercian abbey, but who exactly founded it? Crime writers tell us that to solve a whodunnit you need to establish motive and means to identify the culprit. This sounds like a good approach to so we’ll apply it here. First the means. The monks from Monasternenagh simply couldn’t walk into Imokilly and take the land. This land was already occupied by someone. And evictions were not pleasant experience in twelfth century Ireland, just as they are not pleasant experiences in post-crash Ireland today. You can be sure the local bishop would have objected if he hadn’t been consulted first, for the Cistercians did not allow their abbeys to be placed under diocesan control. Sadly, the surviving records (Ware and others) do not give the names of the founders. But Denis O’Sullivan was able to show that the founders were likely to be two particular local men. The clue that O’Sullivan noted was the location of the abbey estates. These estates were concentrated in two specific areas. The bulk of the monastic estate was in a single block situated on the east bank of the Owenacurra river, in the northern half of the large parish of Ballinacorra. This area comprised the modern townlands of Townparks, Park North, Park South, the northern half of Castleredmond, Broomfield West and Broomfield East, and the later townland of School-lands. These lands were part of the patrimony of the See of Cloyne. But, although we have no evidence for it, one must wonder if these lands were shared with, or possibly farmed by, the Mac Tire family who would have paid a rent to the bishop. Add to this some lands due north of Mogeely were added to the abbey’s estate by the Mac Tire chief. These were Killeenamanagh (literally ‘the little cell of the monks’) and the next townland to the north, Ballygibbon. These last two effectively formed a detached grange of the main monastic estate. In all some two thousand acres were included in the founding grant of the monastery. To top up the funds from this estate, the tithes of Mogeely, and the tithes of the newly founded monastic parish of Chore were granted to the monastery. It should be noted that in the fourteenth century record called the Pipe Roll of Cloyne, the lands originally held by the Mac Tire in Mogeely were actually property of the See of Cloyne, valued at five knight’s fees. By the time the Pipe Roll records were composed, the MacTire had lost their property. So it is not impossible that the Mac Tire also held lands in the parish of Ballinacorra up to the year 1180. Now you may recall that Monasternenagh was founded in 1148 by Turlough O’Brien on sword-land, that is land won by the sword from the O’Donovans. This custom of founding monasteries on sword-land was a means of preventing one’s enemy from taking those lands. The MacTire family contributed to the foundation of Chore because it seems they realised that their own estates were under threat from the Anglo-Normans who had arrived in 1177/1178. By granting part of the estates to a religious foundation, they prevented the land from falling into the hands of their enemies. This proved to be a wise move given that just two years later in 1182, five Anglo-Norman knights, including Milo de Cogan, were murdered in the MacTire seat at Mogeely, sparking off a major revolt against the invaders. De Cogan, you might recall was one of the two leaders of the Anglo-Norman invasion of Cork, along with Robert FitzStephen, whose illegitimate son was also killed at Mogeely. After this rebellion was put down by Raymond le Gros from 1173, the Mac Tire sept seem to have lost their lands. However, the MacTire connection only accounts definitively for two specific townlands, directly controlled by that family. What about the rest of the property, which constituted the main monastic estate in a single block? This was the actual site of the present town of Midleton, in the northern half of the parish of Ballinacorra. This land was likely to have been church land before 1180, let out to tenants, in this case probably the MacTire family. Thus the means for establishing the abbey really belonged to the bishop of Cloyne, Matthew O’Mongaigh. As for motive? Well that too was pretty much something the bishop had. It is likely that the bishop of Cloyne, Matthew O’Mongaigh, was the prime mover in founding Chore Abbey (Midleton). And it is likely that he had a similar motive to the Mac Tire family. His first aim was religious – the Cistercians represented the best of the reforming ideals sweeping the church in Ireland. But Bishop Matthew may also have had more material motives. In granting diocesan lands to a religious foundation the bishop probably hoped to keep it out of the hands of the invaders. The behaviour of the Anglo-Normans during their invasion of Ireland was often brutal – they had sacked the ecclesiastical town of Lismore, seat of the Papal Legate in Ireland, during their initial invasion, and they were not likely to respect Cross lands – that is land held directly by the diocese. Lismore Cathedral was the seat of the Papal Legate to Ireland – but that didn’t stop the Anglo-Normans from sacking the place during their invasion. Was this atrocity an incentive to the bishop of nearby Cloyne to found Chore Abbey (Midleton)? Even more interesting, if we look at the names of the known abbots of Chore (Midleton), we find that most of them were Gaelic Irish, with hardly any Anglo-Norman or English names in the list until the very end. Clearly, Chore Abbey (Midleton) was a Gaelic Irish foundation and remained Gaelic in culture long after its foundation. It seems certain that Bishop Matthew O’Mongaigh of Cloyne was the principal founder of Chore Abbey, with support, or donations of land, from the Mac Tire chieftain at the time. So now you know whodunnit.